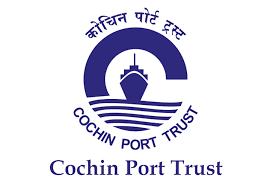 Cochin Port Trust, an autonomous body under the Government of India and which is the largest port in India invites applications from eligible candidates to the following posts. Qualification: Degree or equivalent in Electrical/Electronics and Communication Engineering from a recognised university. Experience:(Desirable)Two years experience in relevant discipline in executive cadre in an Industrial/ Commercial/ Govt. Undertaking. Qualification: Degree or equivalent in Civil Engineering from a recognised university. Experience:(Desirable)Two years experience in executive cadre in Planning/Construction/Design/Maintenance preferably of Port and marine structures in an Industrial/ Commercial/ Govt. Undertaking. Qualification: (i) MOT I Class Motor Certificate issued under Merchant Shipping Act 1958. (ii) One year post Qualification experience as Chief Engineer/2nd Engineer on board a foreign going Ship. Application should be submitted in the proforma given in the website of cochin port trust. Candidates should attach a recent passport size photo and submit documents in proof of age, date of birth,qualification, caste, experience etc. The date of determining the qualification will be 1/3/2017. Age relaxation will be available as per rules. Candidates should submit separate applications for each post. The last date to receive the application to the below mentioned address is 30/4/2017. “APPLICATION FOR THE POST OF ASSISTANT EXECUTIVE ENGINEER (ELE./E & C)”/“APPLICATION FOR THE POST OF ASSISTANT EXECUTIVE ENGINEER(C)”/APPLICATION FOR THE POST OF MARINE ENGINEER”.